Here are a few of the commonly asked questions we receive on inground pools and pool service. How long does it take to install an in-ground pool? Do you offer annual pool opening and closing services? How long does it take to replace an in-ground vinyl liner? What kind of warranties do you carry on your products? What water testing do you do? For Steel Wall/Vinyl Liner, the average time is 4-6 weeks. For Concrete, the average time is 8-10 weeks. For Fiberglass, the average time is 2 weeks. Do you offer pool opening and closing services? 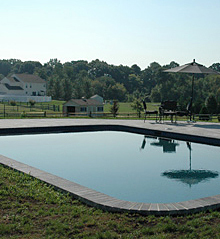 Yes, we do offer a full range of pool opening and closing services. Do you offer weekly or bi-monthly pool servicing to include cleaning and maintenance? Yes. We offer pool servicing & pool maintenance programs to suit your needs and your budget. Let us take the hassle and trouble out of maintaing your pool so you and your family can enjoy your pool! What type of water testing do you offer? We perform on-site water testing in conjunction with our pool maintenance services. (610) 746-SWIM (7946) for Nazareth/Bethlehem & surrounding areaffdeeks.